First off I'd like to thanks Calvin, the judges, and Tales of Adventure for both running a great tournament and giving me access to the decklists and Event Reporter data to run the metagame analysis. Unfortunately Matt (@ChubbyRain ) was unable to attend, but I would nonetheless like to thank him for the joint backend work on P9s and the NYSE which made this report much quicker to generate. VODs are available at https://www.twitch.tv/talesofadventure . I only watched a bit of the coverage, but it seems like Reuben Bresler, Christian Calcano, and later on Brian Kelly did a great job. Here are the stats for archetypes. Note that for this analysis I separated the disjointed Blue Control archetype into Big Blue (Vault/Key, Grixis Thieves) and Hard Control (Standstill, Blue Moon, Control-Heavy Bomberman). I also got rid of the null rod archetype since Eldrazi Tribal belongs with Eldrazi and put the very few non-Eldrazi null rod decks into Other. Here are the same stats broken down into subarchetypes. Note that Other Gush includes Delver, Hydra, Doomsday, TITI, and DP Gushbond. In my opinion the meta moved roughly as one would expect after the NYSE results. 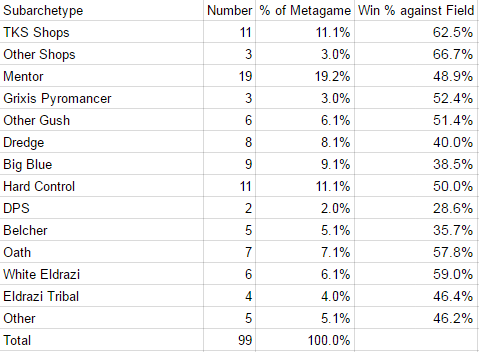 Shops picked up a larger share of the metagame, at what looks like the expense of Eldrazi. Gush dropped slightly after a disappointing performance. In my opinion the biggest takeaway is the continued impressive winrate from the "thorn of amethyst" archetype. Eldrazi did perform much better against shops than in the NYSE. It wasn't just Eldrazi Tribal but also White Eldrazi which did well against TKS shops. I'm not sure what to attribute this to, since on paper it looks like Shops should beat White Eldrazi. 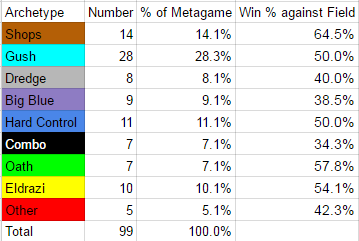 EDIT: numbers have changes slightly due to reclassifying two decks. @diophan I mean. Wow. The completeness and the turnaround time on this is amazing man. Now I know why your parents named you after an equation. Wow, thanks for the work, man, that's amazing! One question. What is a Hard control and how it's different from a Big Blue? Oath's poor performance against shops is surprising... small sample size, I guess. Seemed like a good choice for this tournament. Thanks for the analysis and writeup! So thorough AND so quick! Thanks, again. @CHA1N5 @Topical_Island That's what happens when you get home from a tournament while incredibly tired and instead of thinking "I should go to sleep" you think "I should really have some coffee". @Kasparadi I explain it in the post. Excellent report and thank you so much for providing this invaluable service to the community. I second the notion of having coffee after returning from a tournament. To address the question mark in the original post, I was the 8th seed and I was not playing TKS in my decklist. I had maindeck Crucibles and Karn, Silver Golem. When I was testing Montolio's decklist, I found it very hard to cast TKS a lot of the time and frequently felt that I wanted access to Factory. Since I am a risk-averse coward who is afraid of being unable to cast things, I just fell back on "old shops cards" rather than play the new hotness. I believe the results confirm that my judgment was wrong. I know deck lists aren't up yet but I'd anyone who made top eight would like to ship me their list that would be great. I'm working on an article about the event now. edit: @diophan thanks for the data, you do a massive service for paper vintage and give us unending fuel to have internet fights. @nedleeds Crucible seemed great, but Karn kind of got shut down by Null Rod a lot yesterday. If Jaco's deck is where the archetype is headed, then maybe he's not the best choice. @mickey.nobilis Damnit. I've never said it incorrectly but my typing goes on autopilot. Roland had a conversation with me yesterday about how frequently people do this. Sorry Roland! @kenan he does get stoned by Null Rod, but having an 0/8 holding the fort isn't the worst thing. Depending on how game one goes Null Rod could come or go. For example, a shop deck that shows Drazi multiple Crucibles, Razormane Masticores and Metamorphs may cause the Drazi player to ditch Null Rod (especially on the draw). If you are playing Ravager shops then clearly they leave them in. I was trying to prison them and retard their crappy manabase. May have been too slow. @diophan Amazing to see I was the only Oath player to beat Shops yesterday. I do think Thought-Knot Seer makes the matchup harder, but I still feel pretty strongly favored. Has TKS really made the Shops decks that much better against Oath, or is it just variance causing the decline yesterday?